There are many things to think about when starting a business. What products to sell, what your target audience is and how to reach them, how to make your site stand out amongst competitors. As if this isn’t enough to think of already, but when it comes time to implement your ideas - you now need to create your shop. Though both Shopify and Oberlo are quite intuitive to learn as a platform, there are some things that are easy to miss! Here is a small list of things I have learned along the way, which will hopefully help you too! Apps are great tools you can utilize to add additional functions to your shop. Whether it is setting up a Buy One Get One sale, adding recurring order functionality to your products, or adding product reviews - the list goes on. One thing to keep in mind though is that because each app is unique in how it works, some apps don’t function well with other apps. With Oberlo as an example, as you know, this is an app you add onto your Shopify store which helps you source products to sell. It also facilitates in the order process between your customers and your suppliers. Because Oberlo connects your Shopify products directly with suppliers product listings, breaking the connection between Oberlo and Shopify can cause issues. This is important to remember because certain apps will break the sync between products. As a general rule of thumb, any app that creates a new product variant will cause issues with your connection between Shopify and Oberlo. An example of an app that would break the connection would be a quantity discount app - so buy 1 item at $10, but buy 3 items at $25. In order to do this, the app creates new variants in the system to register this, so those new variants wouldn’t be recognized by Oberlo. If you are unsure if an app you want to use breaks the connection between Shopify and Oberlo, see if there is a way to test with one product. After you have set up the app, and add the new function to your shop for this one item, test adding this item to an order, and see if it shows in Oberlo. That way you know the connection is not broken, and can likely move forward with using it. Either way, always be cautious of other apps, as not all work in conjunction with Oberlo. 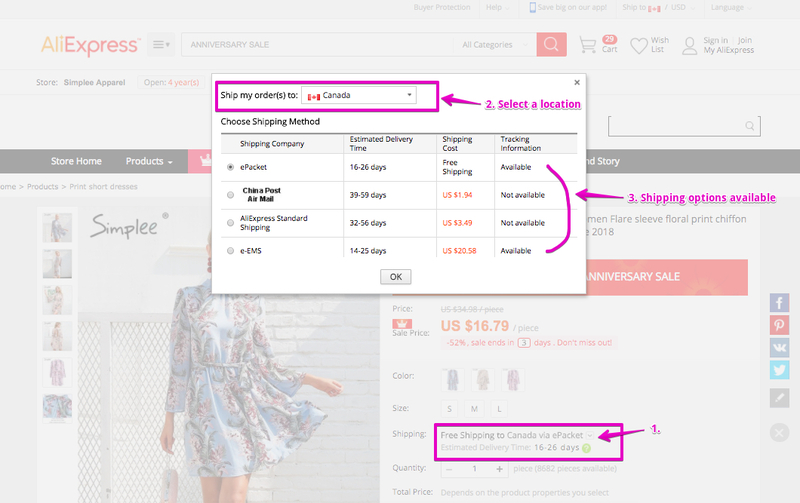 On the note of breaking a connection between Shopify and Oberlo, editing certain aspects of a product can also break the sync. For example, you want to update information on your products in bulk, so you export your items into a CSV. You make the changes you need to the spreadsheet, then re-import your products. Editing in this way is something you will want to avoid, as any time you export then import again, the connection is lost. Duplicating an item is another example of a way to break the connection. The new, duplicate item will not be connected to Oberlo in any way, so avoid doing this too. 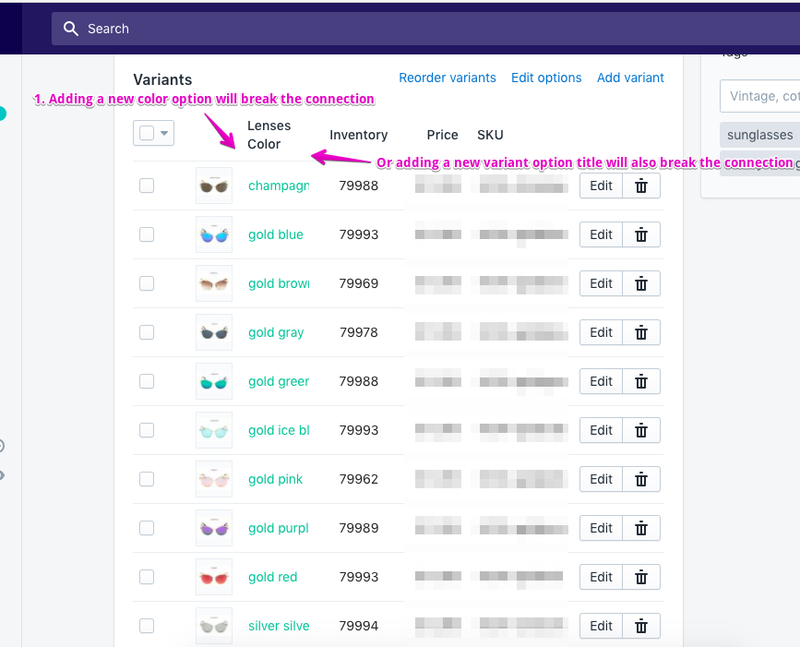 Along with CSV’s, and duplicating products, adding new variants, or adding / deleting variant options will also cause issues. Let’s take these sunglasses as example, if you were to add a new color option for customers to choose from (orange/gold), or add a whole new column for a variant option (style), this will break the connection. If you plan on making changes to your products, you can change the wording of your items, the wording of your variant options, the title, description, and even can change the images. If you are unsure if a change you are going to make will break the connection, reach out to Oberlo support for confirmation. Also, make any changes you can to the product while the item is in the import list, that way you can be sure the connection is not broken yet. If you plan on selling your items to customers all over the world, make sure to check your products ship to these locations. Some suppliers will not ship to specific locations - or if they do, the cost is different than their usual shipping amount. Therefore, always be sure to check locations, and check the cost to ship. There are a few, big differences though between these two which can help you to figure out what may be going on. 1 - You can see in the bottom order there is a Red Aliexpress tag, instead of a Blue Oberlo Supply tag in the above order. This is how you tell if it is an Aliexpress or Oberlo Supply item. 2 - The orders show as shipped, yet 3 - there is no Aliexpress order ID in the second order. The first, most important step for ordering in any case is to make sure you did not fulfill your order in Shopify. Marking it as fulfilled makes the Oberlo system see the order as “sent out”, and therefore it does not see it as needing to be ordered. 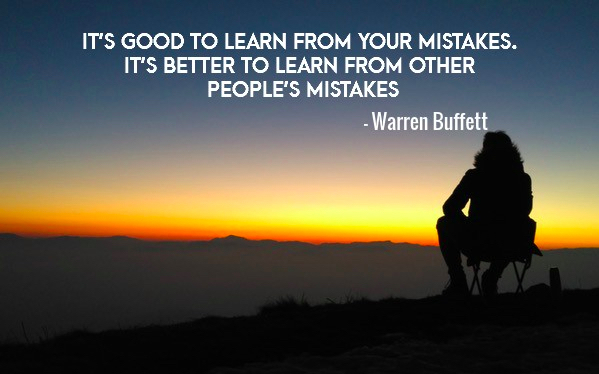 This is mistake one that merchants make in this process. 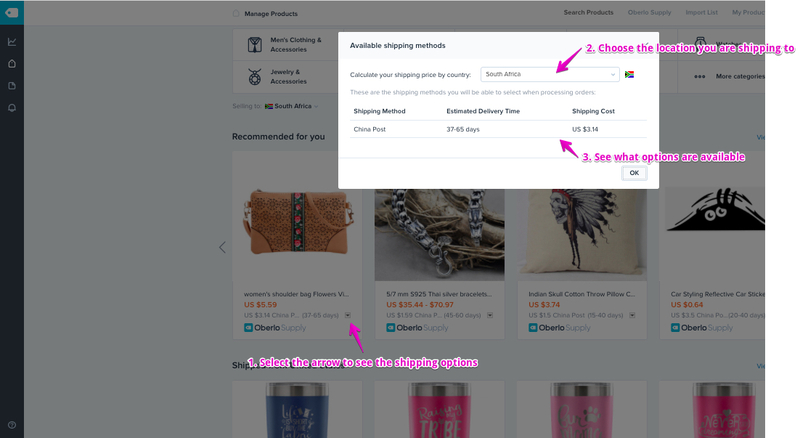 This article here will walk you through how to remove fulfillment for an order, and how to change your settings in Shopify to enure it is not set to be auto fulfilled. Marking an order as fulfilled is why the order shows as shipped, in the second example, even though it technically has not. Always be sure there is an Aliexpress order ID in step three above, that way you can be sure there is an Aliexpress order that corresponds with this. Oberlo Supply orders on the other hand will never show as “Shipped” unless the supplier has absolutely received payment and shipped the item. 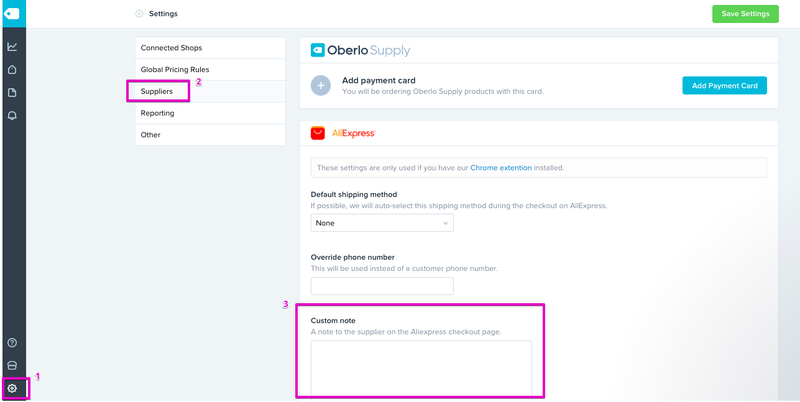 (This is why it is important to note step 1, to see if the order is for Aliexpress or Oberlo Supply). Here are the order steps for both types of products, so I would recommend checking these out if you have not already! "I'm dropshipping. Please DO NOT add any invoices, QR codes, promotions or your brand name logo in the shipments. Please ship as soon as possible for repeat business. Thank you!" This is a bit of a random one, but a very important one at that! Most suppliers from Aliexpress and Oberlo Supply are located in China. In the early months of the year, each year they celebrate the Chinese New Year. This means all production is stopped during this time. It’s important to remember as a dropshipper because this directly affects your shop. Prepare ahead of time for this, whether it means closing down your shop during these weeks, or letting customers know your items are on backorder. Either way, be sure to be prepared on how you want to handle this before it is too late. More info on this here! One section that can be easily forgotten about is the Auto Updates area. This is where you can set up automatic prompts to adjust pricing and inventory, as it fluctuates with the supplier. More information on that here! Take note though that updates can sometimes take 24 - 72 hours to propagate, meaning if an Aliexpress supplier changes the cost of their item, it may take the Oberlo system this amount of time to re-review that item and see if there are updates. So there can be delays in the changes showing. Overall, there are many things to learn and explore along the way, but I hope that these tips gave you some insight on new sections you haven’t checked out yet. Please do share with everyone else if there are other tips you have run into along the way!